The Italian word Tempo literally means "RATE OF SPEED". But the word "Tempo" actually means much more. In the previous lessons we've learned to read notes and play them according to different dynamic signs. So far so good, but we're still missing something that will help us to understand the concept of the whole picture. Music is moving through time. The music tempo informs us how fast or slow we have to play and what is the MOOD that defines a musical piece. Here below, I'm going to add a list of a few MUSIC TEMPO Expressions. These words describe how fast or slow you have to play and what kind of mood you should be producing. If you just started playing the piano, here are the first four music tempo marks you should know. ANDANTE = Moving along. It literally means "At a walking paste". You'll usually notice the music tempo of a piece at the beginning above the first staff. If you to take your next step in reading piano notes you should definately check out the Rocket Piano Ultimate Learning kit. Rocket Piano provide an amazingly handy and effective piano course on various issues such as reading piano notes, playing piano by chords, piano technique and more. Click here if you haven't signed to Piano Playground, our free E-zine yet make sure you do that in order to get the username and password codes for the piano sheets I provide here under. 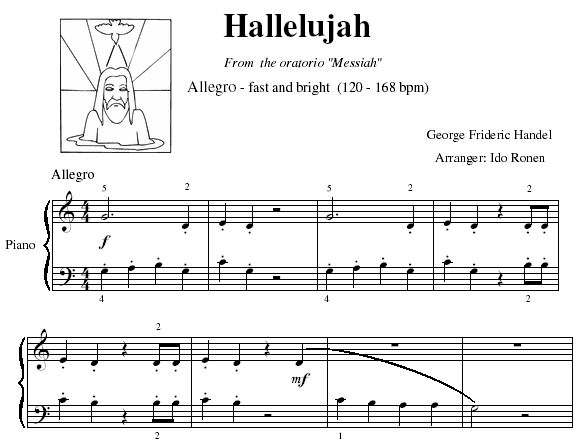 Click here to download the Halelluja by Handel full piano sheet for free. 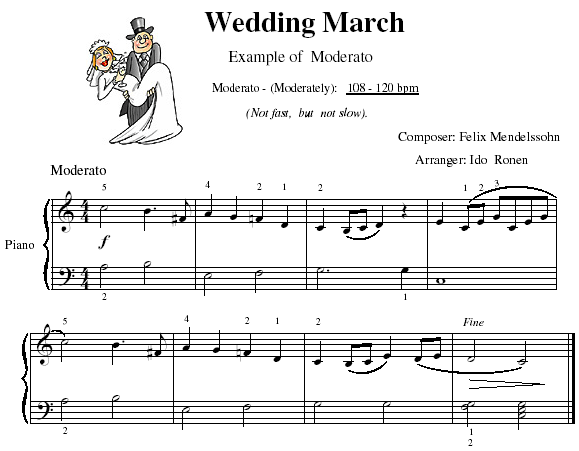 Click here to download the Wedding March by Mendelssohn full piano sheet for free. 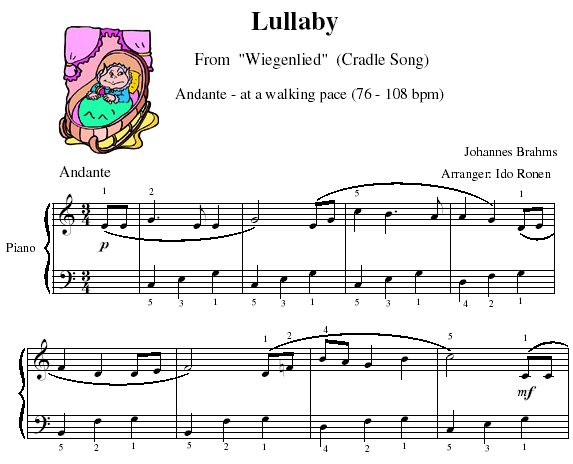 Click here to download Lullaby by Brahams full piano sheet for free. 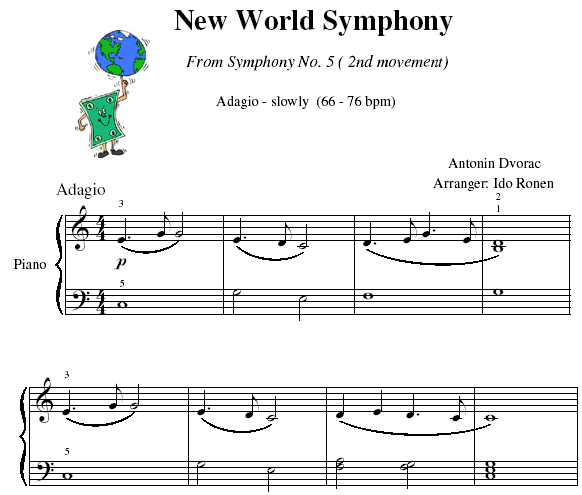 Click here to download The New World Symphony by Dovarac full piano sheet for free. Now, if you're a bit confused with the music tempo expressions, here's an example of how a music tempo expression suggests both the rate of speed and the mood of a piece. Let's take Presto and Allegro for example. Both these tempo expressions direct you to playing pretty fast (When you play presto you have to be a bit faster though). However the word allegro has an extra meaning. It means you have to play in a joyful manner as well (Allegro means joyful in Italian). The word presto means that you actually have to play in a virtuosic style. At first, the rate of speed was indicated only by the Italian tempo expressions but later on this has changed, once the metronome was invented in the first half of the 19th century. It was then possible to measure music tempos in a more accurate manner and say how many beats we should play per minute. In other words, the higher the tempo, the larger the number of beats that should be played in a minute, and, therefore, the faster a piece should be played. This term is also called BPM (Beats Per Minute). However, the Italian words are still written today to state the mood of the piece. The beauty of classical music is that it provides an elastic feeling of time. That means that the tempo of a piece can occasionally change. Let's take the FERMATA for example. When the sign of a FERMATE appears above a note you should hold the note longer than its value. The Fermata gives the note an extra attention as if to let us know how beautiful a certain musical note is in a piece. At the end of many pieces we use the fermata as well to prolong the ending which creates a natural fade-out of the sound at the last note/chord. The Italian word Ritardando means GRADUALLY SLOWING THE TEMPO. It is often abbreviated retard. or rit. When we're expected to RESUME THE ORIGINAL TEMPO we'll see the words a tempo above the place. Here's a common example of a Fermata sign and a Ritardando sign in the song Happy Birthday to You. 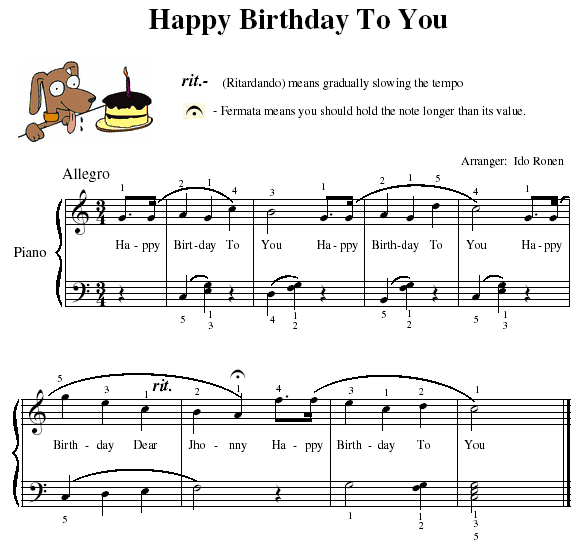 Click here to download the Happy Birthday full piano sheet for free. Here's a list of other Music Tempo Marks which state a change in a tempo. Ritenuto - slightly slower; temporarily holding back. (Note that the abbreviation for ritardando can also be rit. Thus a more specific abbreviation is riten. Also sometimes ritenuto does not reflect a tempo change but a character change instead. Tranquillamente - adverb of tranquillo, "tranquilly"